There is a particular reason if we named our propertry Alla Porta Rossa (At The Red Door). 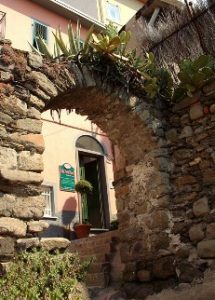 Its name is not random but a tribute to the history of the village of Manarola. In the XI century the inhabitants of Volastra, the ancient Vicus Olestre, the land of olive trees, descended from the hills towards the sea where a small village, now called Manarola, sprang up. 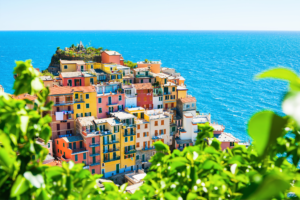 Some experts think that the ancient name of Manarola comes from Manium Arula, a small temple dedicated to the dead; for others, however, it arises from A Manaea, a dialect term whose origin is located in Magna Roea, great wheel of a watermill. 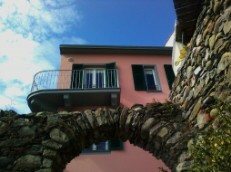 In fact in Manarola there are still rests of old mills! 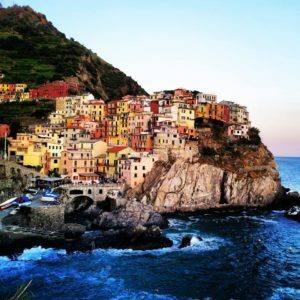 While not knowing the exact origin of the name of Manarola, we still know for sure that the original settlement of the village was built on a rocky promontory overlooking the sea. Thanks to its singular and convenient position, the new village, naturally fortified and protected, grew in importance and the population increased quickly. However, till the half of the XIII century it remained subordinate to Volastra as far as Nicolò Fieschi realized its strategic importance and changed it into a big castle. Over the centuries, after several pirate incursions, the castle was almost completly destroyed… Almost, not completly… The small remaining part of it has been restored by our family and it is now residence of the lovely romantic little family property Alla Porta Rossa in front of which you can still enjoy the ruins of the old Porta Superiore, the main entrance to the castle, also called Porta Rossa.